My first impression of Hanoi was sensory overload. When you walk through the Old Quarter, you move through a sea of flying motorbikes, open flame cooking on the sidewalks, and chattering crowds perched on low plastic stools. After a few days, I started to notice quieter corners of the city – fading colonial shop-houses, centuries-old temples, and sprawling banyan trees hung with incense and tokens of prayer. After centuries of occupation and war with China, France, and the U.S., Vietnam is now undergoing rapid development, as well as establishing itself as a top tourist destination. Many travelers can simply show up and stay for two weeks to a month, while others, like US citizens, can apply easily for a one or three-month entry visa. This guide will help you navigate the 1000-year old city of Hanoi and find things to do, sights to see, foods to eat, and the best day trips outside of the city. Read on for the 26 best Hanoi activities. I divided Hanoi’s attractions into four categories: things to do, sights to see, foods to eat, and day trips. Since it’s a long list, feel free to click on an activity of interest and get to it directly. Otherwise, scroll down for the full list of things to do in Hanoi, Vietnam! These are some of Hanoi’s top activities, from shopping to cooking to watching Vietnamese puppets dance on top of an indoor pool. Read on to figure out what to do in Hanoi on your Vietnam trip. The Old Quarter, also known as the Hoan Kiem District, is made up of narrow, meandering streets that date back to the city’s founding 1,000 years ago! This ancient area, which is a popular spot for Hanoi tourism, contains a mix of fading colonial buildings and Buddhist temples and pagodas. You’ll be sharing the narrow sidewalks with motorbikes (both parked and driving), vendors, and crowds spilling out of restaurants. When crossing the traffic-choked streets, just try to look ahead and keep a steady pace. The motorbikes will drive around you! The Old Quarter has long been home to Hanoi’s artisans and craftsmen, and their work is reflected in the name of the streets. You can find the street with silver artisans (Hang Bac), paper craftsmen (Hang Ma), and wood carvers (Hang Go). Today, there are still high-quality crafts stores that sell art, silk, jewelry, carvings, instruments, and other creations. Along with traditional handicrafts, you’ll also find an abundance of designer knock-offs, from “Gucci” watches to Nike sneakers to countless North Face goods. North Face is based out of Vietnam, but most of the clothes on the streets are fakes. You might find a few “factory seconds” on the streets – authentic North Face goods with slight imperfections, like a crooked stitch – but most aren’t the real thing. That’s not to say some of the products don’t look and feel almost identical to actual North Face products. They just won’t have the same durable, outdoorsy quality as authentic goods. When you shop in the Old Quarter, expect to do some haggling over prices. Indoor shops may have fixed costs, but most outdoor vendors expect to negotiate. You may also find people approaching you to sell donuts or other foods. Some try to hang baskets over your shoulder or place a straw hat on your head and charge for the photo opportunity. If you’re not interested, it’s best to say no thanks and keep walking. If you hesitate, you might find yourself wearing a pointed hat before you know what happened. If you get hungry or thirsty, you’ll find lots of cafes, restaurants, bakeries, and food stalls during your tours of the Hanoi Old Quarter. Sometimes random food stall stops will lead you to some of the amazing food in the city! Vietnamese water puppetry is an art that dates back to the 11th century. It’s essentially a puppet show on water, and the puppeteers stand in the water out of sight and use long sticks to perform their craft. Each puppet dance enacts a legend in Vietnamese history. The guidebook will give you insight into what each dance means. The show is accompanied by live musicians playing traditional Vietnamese music. The Thang Long puppet troupe has played all over the world, introducing people to Vietnamese water puppetry. The show is especially good for kids, but I think people of all ages would enjoy this unique art form as you plan out what to do in Hanoi. The Thang Long Water Puppet Theatre is open 365 days a year. You can find it at 57b Đinh Tiên Hoàng, Hoàn Kiếm. Dong Xuan Market dates back to 1889 and is a key Hanoi attraction as the city’s largest indoor market. On the first floor, you can buy fresh produce, meat, and seafood. The upper floors sell a range of souvenirs, accessories, clothing, electronics, appliances, fabrics, and handicrafts. There’s also a lively back section where you can buy pets, mainly cats, dogs, and fish. Beside the fresh ingredients, you can also find a prepared food with area with vendors selling soups, local foods like bun cha (grilled pork with noodles), and coffee. Just as with most of the shopping in the Old Quarter, expect that most prices can be negotiated. Dong Xuan Market is open everyday from 6 AM to 7 PM. You can find it on Dong Xuan Street in the Hoan Kiem District. While the Old Quarter can feel pressed together and chaotic, the French Quarter is more open and spacious. Along its wide, tree-lined boulevards sit elegant French-style villas from the late 19th century. Hanoi’s most upscale areas are located in the French Quarter, and it’s here that you can find some of the fanciest hotels and restaurants in the city. One impressive hotel is the Hotel Sofitel Legend Metropole, built in 1901. You can get a taste of its opulence by making a reservation for its afternoon High Tea and Chocolate Buffet (about $25). Its best selling point? It has a chocolate fountain. The northeastern part of the French Quarter is mostly residential, but it’s a really pretty place to walk around and get a fuller sense of the many different faces of Hanoi. As a thousand-year-old city, Hanoi is a mix of past and present. After exploring the ancient labyrinth of the Old Quarter and 19th-century villas of the French Quarter, head to the top of a glass and steel high-rise built in the last decade. Hanoi has lots of “sky bars” scattered throughout the ever-growing city where you can find cocktails and enjoy views of the city skyline. Its rooftop bars are also a serene break from the noisy streets below. Some great rooftop bars in Hanoi are Pepe La Poulle, Avalon, Day’s Ta Ho, Summit Lounge, Bar Betta, La Place, and the aptly named Rooftop. Would you like to learn how to make Vietnamese food yourself? There are several cooking schools throughout the city that will teach you the flavors, history, and preparation of Vietnamese cuisine. Most cooking classes start by taking you out to a food market and teaching you how to shop like a local. After your food market Hanoi tour, you’ll head back to the class and gather your ingredients at an individual cooking station. You’ll make a variety of dishes, including appetizers, entrees, and desserts. The best cooking classes in Hanoi are Hidden Hanoi, Vietnam Culinary School, EZ Cooking Class, and Hanoi Cooking Centre. A day cooking class typically costs around $50 per person. If you’re a fan of the dramatic arts, then you should check out the Hanoi Opera House. Built between 1901 and 1911 by the French, the opera house was modeled on one of Paris’s top opera houses. Today, the Hanoi Opera House puts on productions of both Vietnamese and Western operas, plays, ballets, and other dance productions. Vietnamese opera tends to showcase historical and folk stories, and the performers wear extravagant makeup and costumes. Tickets have a wide price range, from as little as $9 to over $100 depending on the production and your proximity to the stage. You can find the full production schedule on the Hanoi Opera House website. It’s located at 1 Trang Tien Street. Tay Ho Lake is the largest lake in Hanoi. According to legend, it was formed by a dragon king named Lac Long Quan. It’s a popular spot for walking and renting swan-shaped pedal boats. You can drift around the tranquil lake, see Tran Quoc Pagoda, a Buddhist pagoda on an island, and pedal out to a floating restaurant for lunch. Swan boat rentals cost about $3.50 for an hour (80,000 VND). As an ancient city, Hanoi still has several temples and historic sites dating back over 600 years. Here are the top six historical attractions in the city. Hoan Kiem Lake sits between the Old Quarter and the French Quarter. If you’re staying in or exploring the area, the lake is a useful landmark for navigating your way around. Hoan Kiem translates to Lake of the Returned Sword. According to legend, Emperor Le Loi was taking a boat across the lake in 1428 when a golden turtle god surfaced. The turtle god asked Le Loi for his magic sword, named Heaven’s Will. The emperor gave the sword to the turtle god and renamed the lake after this magical encounter. Large turtles lived in this lake for hundreds of years, though the population may now be extinct. The last known large turtle in Hoan Kiem was found dead in January of 2016. You can find a large statue of a turtle on Jade Island inside the Temple of the Jade Moutain, or Ngoc Son Temple. This 18th century temple honors a 13th century military leader and is surrounded by pretty bonsai trees. Vietnam has been engaged in near-constant battles or occupation for the past many centuries. It faced invasion by China and then became a colony of France from the 1800s until 1954. One of these prisoners was John McCain, and an exhibit in the prison shows the alleged flight suit that he was wearing when his plane was shot down. The prison doesn’t have a lot of emphasis on the Vietnam War, instead focusing on the brutal treatment of the Vietnamese at the hands of the French. What the Vietnam War exhibits do show are apparently staged photographs of prisoners celebrating Christmas or playing basketball and chess. There’s zero mention of mistreatment or torture. Hoa Lo Prison is located at 1 Hoả Lò, Trần Hưng Đạo, Hoàn Kiếm. When you’re in Vietnam, you’ll see images of Communist leader Ho Chi Minh everywhere. His face appears on every banknote, for instance, so you’ll see his portrait every time you make a purchase. Vietnam’s most populous city, formerly known as Saigon, is now called Ho Chi Minh City. Ho Chi Minh was a leader of the Communist party and president of the Democratic Republic of Vietnam (North Vietnam) from 1945 to 1969. He was also a key leader of the Viet Cong during the Vietnam War. He’s a much celebrated figure in Vietnam and his iconic presence continues to dominate the country fifty years after his death. Ho Chi Minh’s remains are kept in a glass sarcophagus in the central hall of his mausoleum. This imposing marble edifice was styled on Lenin’s Mausoleum in Moscow. 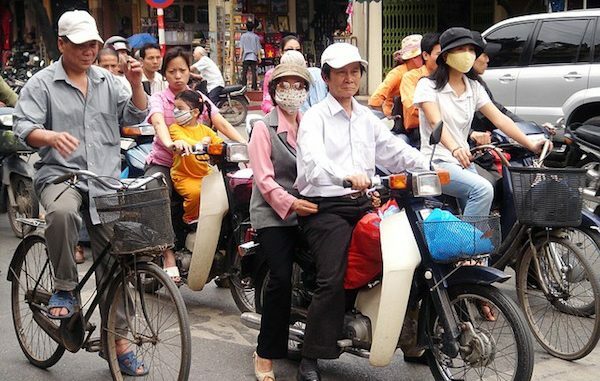 Rules of conduct are strictly enforced in this popular Hanoi tourist destination, with guards making sure that you cover your legs and shoulders, don’t cross your arms or put your hands in your pockets, and stay organized in a neat line. The Ho Chi Minh Mausoleum is only open in the morning, from 9 AM to 11 AM. It’s located at Số 1, Hùng Vương, Điện Biên, Ba Đình. The Temple of Literature is one of the most beautiful spots in Hanoi, with its ancient architecture, interior courtyards, gardens, and small lake. The temple was built in 1070 and dedicated to Confucius. Six years after its construction, the temple housed Vietnam’s first university. Today, the Temple of Literature is featured on the 100,000 VND bill (on the opposite side of Ho Chi Minh). You can tour the grounds, pass under traditional gates, and visit a small museum to see the writing instruments, books, and other personal belongings of students who once studied at this ancient university. The Temple of Literature is located at 58 Quốc Tử Giám, Đống Đa. Bach Ma Temple is believed to be even older than the Temple of Literature, making it the oldest temple in Hanoi. According to legend, Emperor Ly Thai To found this spot thanks to the guidance of a white horse. It was here that the emperor founded the city of Hanoi. You can see a statue of the fateful white horse inside this beautiful stone temple. The Imperial Citadel of Thang Long is a cultural complex with overlapping ruins starting in the 11th century. The Ly Dynasty first built royal houses here, and the complex was later expanded by subsequent dynasties. The French tore many of the structures down, but archaeologists recently excavated ruins and relics from beneath the earth. In 2010, the citadel became a UNESCO World Heritage site. Archaeological explorations are still ongoing. Today, you can see the remains of 11th century edifices, as well as the D67 Tunnel, the underground headquarters of the Vietnam People’s Army from 1954 to 1975. These historical sites are scattered around the city. Most are within walking distance, or you can hop in a cab to get from place to place. Check out the map of historical sights below, and click on each pin for a specific address. Vietnamese cuisine is known for its complex flavors and use of sauces, fresh herbs, and spice. Its most popular foods involve grilled meat and fish, noodle dishes, soups, sandwiches on baguettes, and fresh rolls wrapped in rice paper. Common sauces in Vietnamese cuisine are fish sauce, hoisin sauce, shrimp paste, hot chili sauce, and soy sauce. Some of the most-used herbs are lemongrass, cilantro, ginger, mint, coriander, chili, lime, cinnamon, and Thai basil. You can find lots of delicious and inexpensive street food or check out the modern cooking scene at sit-down restaurants. A lot of the less expensive restaurants have outdoor seating at low tables on the sidewalk. Here are some traditional Vietnamese foods you should try in Hanoi once you find your way to a little plastic stool. Bún chả: grilled pork and rice noodles, served with herbs and various dipping sauces. This ubiquitous dish is thought to have originated in Hanoi. Bánh mì: Bánh mì technically just refers to bread, but people use it to describe the sandwich on a baguette. You can usually choose the type of meat or tofu that goes inside. Then the filling is topped with cilantro, cucumber, and pickled carrots and daikon (a type of radish). Phở: noodle soup with a beef broth, rice noodles, meat, and herbs. If you want a chicken-based soup, look for pho ga. Street vendors sell this delicious soup all over the place. Bún bò nam bộ: grilled beef over rice noodles. It’s typically served with cucumbers, lettuce, papaya, herbs, crushed peanuts, and fried onions (so many flavors!). You can mix in your favorite sauces to add even more flavor and spice. Bánh cuốn: Vietnamese steamed rice rolls. These rolls, made with a steamed fermented rice batter, traditionally contain ground pork, minced mushrooms, and shallots. Bún thang: vermicelli (wide rice noodle) soup with chicken, egg, onions, fish sauce, shallots, and cilantro. The soup sometimes has pork, as well. The coffee is often brewed cup-by-cup with a drip device that sits on top of the glass. You can get hot coffee, iced coffee, or egg coffee, which is made with an egg yolk and sugar or condensed milk. Vietnamese beer: Vietnamese beer is light, low in alcohol at just 4-5%, sometimes as cheap as 30 cents, and everywhere. The most popular beers are Saigon, Tiger, and Hanoi beer, all lagers. The biggest producers in Vietnam are Sabeco Brewery, which produces Saigon beer, and Vietnam brewery, which makes Tiger. Below are a few restaurant recommendations for getting bun cha, pho, coffee, beer, and other Vietnamese specialties. Pho Bat Dan: This spot is famous throughout Hanoi for its excellent pho. You might have to wait in line for a bowl of the good stuff. Address: 49 Bat Dan street, Ha Noi. Dac Kim Restaurant: Come here for the delicious bun cha, or grilled pork with noodles. It’s a casual spot that’s popular among locals. Address: 1 Hang Manh street, Ha Noi. American Storm: I discovered this place by accident when walking on the French Quarter side of Hoan Kiem Lake. The owner had recently returned from San Francisco, where he ran a Vietnamese food truck. American Storm now serves his modern takes on traditional Vietnamese dishes. It had great food and smoothies, along with homemade ice cream made from whatever fruit is in season. If you order the American Storm, you’ll get their version of an ice cream sundae. Below are three day trips you can take from Hanoi, plus a fourth that takes you a little further afield. Read on for unique ideas for Hanoi tourism with these places to see outside Hanoi. This beautiful national park sits just an hour outside of Hanoi. It covers 26,720 acres and has three main peaks: Vua Peak (4,251 feet), Tan Vien Peak (4,022 feet), and Ngoc Hoa Peak (3,674 feet). If you decide to hike one, you’ll find temples at the top, one of which is dedicated to Ho Chi Minh. The mountains are often shrouded in fog, like much of northern Vietnam. You’ll also find an orchid garden and a bird garden. The Perfume Pagoda is a large complex of Buddhist temples and shrines built into the mountainside, the poetically named Mountain of the Fragrant Temples. At the center of this complex sits the sacred Perfume Temple inside Huong Tich Cave. The temples appear to date back to the 15th century. As beautiful, sacred, and remote sites, they’re a destination for religious pilgrims who come from all over Vietnam. Hundreds of people also flock to the Perfume Pagoda every February for a yearly religious festival. As the complex is such a sacred place, make sure to wear modest clothing and cover your knees and shoulders. The journey to Perfume Pagoda is almost as beautiful as the destination. After a two-hour drive from Hanoi, you take an hour-long rowboat trip past limestone cliffs. The boats are rowed by local women from the village of My Duc. Once there, you can walk to the summit of the Mountain of the Fragrant Traces or take a cable car to the top. While the Perfume Pagoda is beautiful, spiritual, and calm, Le Mat Snake Village is weird and kind of freaky. Located about 10 to 30 minutes outside of Hanoi, this village’s claim to fame is that it has bred snakes for the past 900 years. The whole village is set up around snakes: seeing live snakes, eating snakes, and drinking snake wine. How is snake-based food prepared, you might wonder? Well, you can have snake soup, fried snake, fried snake skin, steamed snake meat wrapped in leaves, or even sauteed snake heart. Some restaurants have cages with live snakes, and you pick out your future dinner like you would a lobster. Grass snakes are the cheaper option, while cobras are more expensive. For an entertaining account of one brave soul’s adventure at the snake village, check out this article in Vice. The writer documents his experience taking a shot of snake wine with a beating snake heart in the glass. The village might be more of a tourist attraction for those who want to test their boundaries in Vietnam than any kind of authentic local tradition. Snake wine, though, is a traditional drink that was first made in China in 771 BC. Rice wine is fermented in a jar with whole snakes; other variations add scorpions, geckos, and seahorses. Snake venom has long been associated with virility and sexuality, as well as certain medicinal effects, like helping eyesight and preventing hair loss. You drink snake wine as a shot. Some people also eat parts of the animals inside. Going to Le Mat Snake Village is definitely one of those strange experiences you can only have in Southeast Asia! This fourth suggestion is not actually a day trip, as it’s located a five-hour drive or overnight train from Hanoi. I mention it because it’s a popular trip for travelers based out of Hanoi. This beautiful mountain town gives you sweeping views over a terraced-valley and tall mountains. You can hike the tallest point in Vietnam and take trekking trips to traditional Hmong villages. Hmong people also walk around town selling traditional handicrafts from their villages. Like Hanoi, you’ll also find lots of “North Face” products and gear. Sapa was the foggiest place I’ve ever been. My hands started to fade into the mist when I stuck them out in front of me. Instead of the valley below, all I could see was a solid wall of white. It was incredibly atmospheric and eerie, especially when I heard hidden Vietnamese music drifting out from somewhere behind the fog. When the mist finally cleared, I saw stunning views into the valley that had been sitting out of sight below. So there you have it, the top things to do, places to see, foods to eat, and day trips to take in Hanoi, Vietnam. In closing, let’s go over some final thoughts about traveling to this bustling Southeast Asian metropolis. Hanoi is a buzzing, busy, often chaotic city unlike anywhere I’ve ever traveled. It’s a mish-mash of ancient and brand new, and one gets the sense that things are developing at a faster pace than the city’s infrastructure is prepared to handle. Get ready for criss-crossing motorbikes, heavy bundles of telephone wires overhead, and vendors squeezing their wares into every free inch of sidewalk space. All of the movement and energy is exciting, but can also get tiring, especially combined with the sometimes poor air quality. For a retreat from the busy streets of the Old Quarter, you can make your way to the spacious French Quarter, walk around one of Hanoi’s lakes, or take refuge in a centuries-old temple amid wafting incense and offerings of fruit. You can also have the quintessential Hanoi experience by taking a seat with the crowds on a little plastic stool, enjoying a cheap, light beer and tantalizing bowl of fragrant soup as the world flashes by. Whatever you choose to do in Hanoi, your visit will surely leave you with a deeper understanding of Vietnam and new experiences that you’ve never had before.